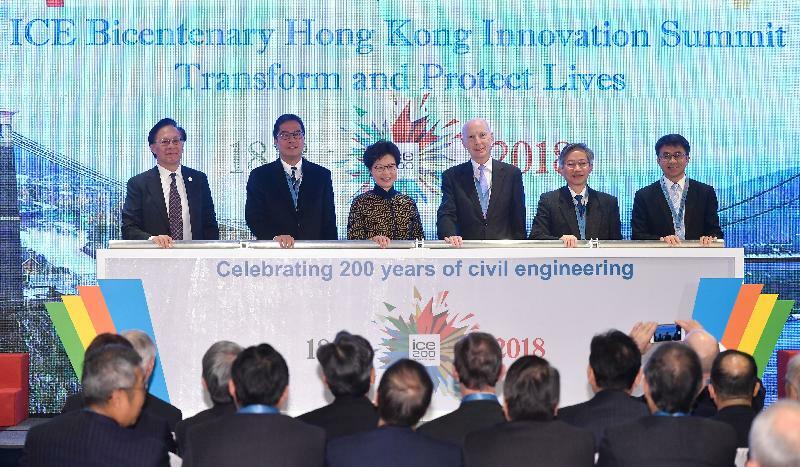 I am very pleased to be here today, in my capacity as both Chief Executive of the Hong Kong Special Administrative Region and Honorary Fellow of ICE, at the ICE Bicentenary Hong Kong Innovation Summit, to congratulate the ICE on its 200th anniversary. Founded by three young engineers in a London coffee shop, ICE has evolved into a global organisation and today it counts some 91 000 members in more than 150 countries. It is indeed a remarkable achievement. A measure of the importance of ICE, and the civil engineers who make it shine, can be found at a glance of your Summit programme brochure. It offers a profusion of welcome messages coming from the extraordinary range of industry interests that depend on the support of civil engineers. The brochure features laudatory messages from a wide range of government bureaux and departments, as well as the Construction Industry Council, the Hong Kong Science and Technology Parks, the Mass Transit Railway, Occupational Safety and Health Council, the Productivity Council, the Urban Renewal Authority and more. These, and so many other players, count on you, civil engineers, to help shape our economy, our society and the prosperity we are all working for. I am not an engineer by training or profession, but I have had ample opportunity to work closely with many civil engineers in my previous capacity as Secretary for Development. And I am grateful to them for their knowledge, skills and experience, which continue to "transform and protect lives", as today's summit theme so aptly highlights. 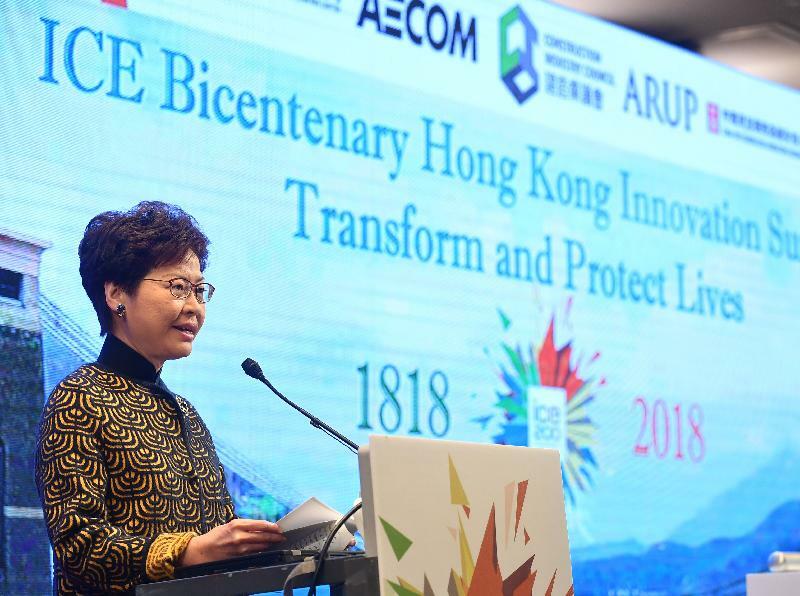 In Hong Kong, civil engineers have been instrumental in building our renowned infrastructure, in providing solutions to many of our social challenges despite the numerous natural constraints they must work with, and in keeping our city safe. The primary challenge is a shortage of developable land. Topographically, Hong Kong is mountainous with scanty flat land. Reclamation has long been one means of increasing land supply for community and economic development, with the earliest reclamation projects going back to the early 1850s, forming the land that became the Queen's Road Central and the Bonham Strand today. While these engineering challenges still remain, today's engineers have to be equipped with the skills and temperament in conducting public engagement to secure community support for some of the land supply solutions. Providing public utilities is another challenge. In the past, the people of Hong Kong got their water from wells and streams. Our first reservoir, in Pok Fu Lam, on Hong Kong Island, was built in 1863, to meet the surging demand for potable water. While a stable supply of water is secured through purchasing water from Guangdong, engineers now are preoccupied with stepping up leakage control, promoting the use of reclaimed water and venturing in seawater desalination. Transportation was a challenge from the very beginning, given the rugged uplands and steep slopes that characterise so much of Hong Kong. The construction of the Kowloon-Canton Railway in 1910 was one of Hong Kong's earliest large-scale transport successes. Our Mass Transit Railway system now reaches into all of Hong Kong's 18 districts, and forms the backbone of a comprehensive and efficient public transportation network. Connecting regionally and globally was another challenge, one we met with our Airport Core Programme (ACP) in the 1990s, and some of the distinguished engineers associated with ACP, like James Blake and Douglas Oakervee, are with us today. It covered the construction of a new airport, as well as the road and rail links to the airport. Today, the Hong Kong International Airport is the world's busiest cargo gateway and among the world's busiest passenger airports. It has helped secure Hong Kong's position as a regional transshipment centre, a passenger hub and a gateway to Mainland China and the rest of Asia. And we are working to maintain our regional and global competitiveness by building a three-runway system, involving the reclamation of some 650 hectares of land. Speaking on connectivity, you would no doubt be aware that the 26-kilometre Hong Kong Section of the Guangzhou-Shenzhen-Hong Kong Express Rail Link, due to open in the third quarter this year, will take passengers from Hong Kong to Guangzhou, non-stop, in 48 minutes. The massive 41.6-kilometre Hong Kong-Zhuhai-Macao Bridge, which is reaching readiness for commissioning, will shorten travelling time between the Airport and Zhuhai from four hours to 45 minutes. To provide more convenience to the hundreds of thousands of daily commuters between Hong Kong and Shenzhen, a new control point, the seventh land crossing, will also be completed this year. These major cross-boundary infrastructure projects will enhance Hong Kong's connectivity with Mainland China, providing us with access to the latter's people, capital, land, market and other opportunities. A tribute to civil engineers in Hong Kong will not be complete without highlighting the silent heroes in doing projects which are less eye-catching. By this, I am referring to my many engineering colleagues working on drainage and sewerage projects, reducing significantly the number of flood-prone spots in Hong Kong, and protecting our environment. Likewise, our geotechnical engineers, committed to extensive slope safety works over several decades, are heroes of our city. The above-mentioned projects were or will be completed by numerous engineers over the span of our development history. Diversified they may seem, they all serve the same purpose of protecting and transforming lives. Our civil engineers' contribution to making Hong Kong a global city as it is today is out there for all to see. My Government is committed to ensuring that Hong Kong will continue to be a thriving, sustainable and liveable global city. To achieve that in the era of innovation and technology (I&T), we have to build Hong Kong into a world-class smart city. In this regard, we published the Smart City Blueprint for Hong Kong in December last year. The Blueprint maps out development plans in the next five years, aiming to enhance the effectiveness of city management and improve people's quality of living as well as Hong Kong's attractiveness and sustainability by making use of innovation and technology. It lists out various strategies and initiatives in six major areas, namely "Smart Mobility", "Smart Living", "Smart Environment", "Smart People", "Smart Government" and "Smart Economy". Some of the initiatives will help address the social challenges that I mentioned just now. Take transportation as an example. Given our development density, there is little scope for us to widen our existing roads or build new roads. Instead, we will work towards an intelligent transport and traffic management system. We plan to complete the installation of about 1 200 traffic detectors in all strategic roads to provide real-time traffic information, and develop the installation of "in-vehicle units" for allowing motorists to receive such information. We will install new on-street parking meters with provision of parking vacancy information, and examine practicable measures to enable public car parks to also provide such information so as to facilitate drivers to find parking space without unnecessarily circulating on roads. We are going to engage the public to develop a detailed Electronic Road Pricing Pilot Scheme in Central and its adjacent areas. We will introduce pilot intelligent traffic signal systems at road junctions. We will also adopt an automatic tolling system for the new Tseung Kwan O-Lam Tin Tunnel. All these will help people plan their journeys and move around more efficiently, thereby increasing the capacity of our road network and alleviating traffic congestion. To support smart city development, we will invest heavily in digital infrastructure. We will push ahead with the eID initiative, allowing everyone to use a single digital identity and authentication to conduct government and commercial transactions online. We will implement the multi-functional smart lampposts pilot scheme starting from 2019 to facilitate collection of real-time city data to enhance city management and other public services, as well as complement the future infrastructure development for 5G mobile communications services in Hong Kong. We will also encourage open data in public and private sectors. Among others, we will build a new big data analytics platform by 2020 which will enable real-time data transmission and sharing among government departments. I am personally chairing a high-level, inter-departmental Steering Committee on Innovation and Technology to steer development of I&T and smart city projects, ensuring that they will be taken forward in an expeditious and efficient manner. However, government efforts alone would not be sufficient. Smart city calls for close collaboration among the Government, industry, academia and citizens over the whole cycle of implementation: from identification of city challenges, formulation of policy and strategy, research and development, conceptualisation of potential projects, feasibility assessment and proof of concept through pilot projects to city-wide implementation. Taking into account the experience in other jurisdictions, we will consider appropriate implementation models, including public-private partnership, for smart city projects. A dedicated Smart City Office will be set up in the Innovation and Technology Bureau to co-ordinate smart city projects across different government departments and agencies in the public and private sectors and monitor project progress and effectiveness. I know that smart city as well as innovation and intelligent infrastructure will be among the topics to be covered in today's Summit. I am sure that you will all benefit from the insight of the distinguished speakers. Such knowledge and experience sharing will no doubt help engineers continue their meaningful work to transform and protect lives. On that note, I congratulate ICE once again on its 200th anniversary. I wish you all a very rewarding Summit and the best of business in this brand-new year.